There's something about back-to-school commercials, cooler weather and the leaves changing colors that always makes me crave warm decadent casseroles. My father is the king of casseroles and we grew up having at least one or two a week. He was the cook in our house and got a kick out of throwing together whatever he could find in the kitchen and coming up with new and unique casserole recipes. Most of the time they were pretty good - usually a combination of rice or noodles, cheese, chicken and veggies. Other times, they were not so great. I remember one particular casserole (which I believe featured canned tuna or salmon or something) that was SO bad that the dogs wouldn't eat it. We had a strict 3-bite minimum that my dad waived (for the first time ever) that night. Before there was Mac, I used to love spending hours in the kitchen trying out new recipes and challenging my cooking skills. I hardly ever stuck to a recipe and loved to experiment with ingredients and make it up as I went along. Like my dad's recipes, there were some pretty outstanding results, along with some tragic failures. My biggest obstacle is always patience - I like to cook on high and with wine (for me, not the recipes), so needless to say we've ended up ordering pizza a couple evenings and throwing out whatever I burnt. However, these days, I don't have the time, energy or patience to cook 5 course meals. I'd much rather spend my free time after work hanging out with my little man in the front yard, than slaving away in the kitchen. 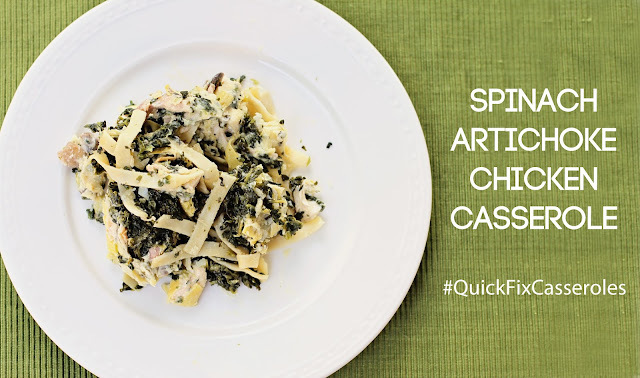 I'm always on the lookout for quick and delicious one-dish recipes that the whole family will enjoy. So, when I was asked to share a casserole recipe for Country Crock, as part of their back-to-school #QuickFixCasseroles campaign, I was so excited! Now my challenge was to come up with something amazing that you would all want to eat. 1. Cook pasta according to package. Drain. Put in casserole dish. 2. Saute garlic in 2 tablespoons of Country Crock spread. Pour over pasta and stir to coat. 3. Drain spinach well and put over pasta in casserole dish. 4. 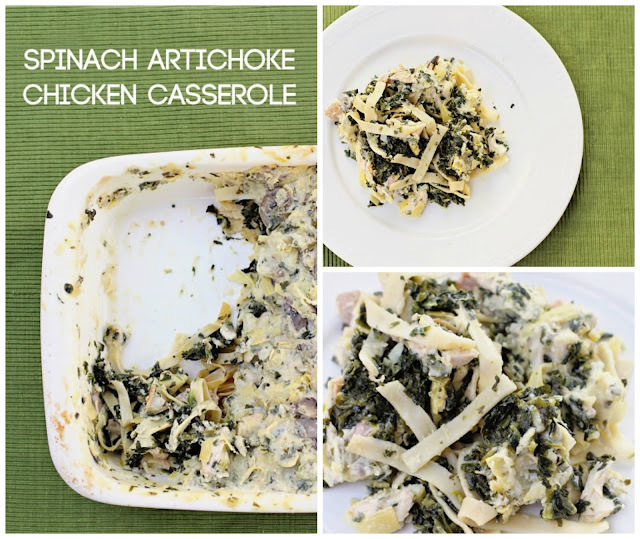 Layer cooked chicken over spinach. 5. Saute mushrooms in 3 tablespoons of Country Crock spread. Drain juices. Set aside. 6. 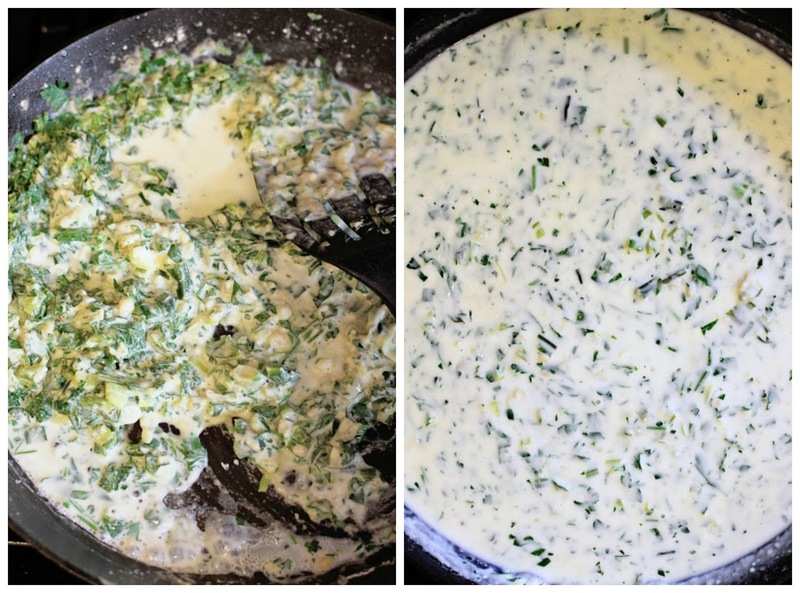 To make sauce: Saute green onions in a large skillet with 5 tablespoons Country Crock spread. Turn heat down and add flour, parsley, salt and pepper. Add milk gradually and turn up heat until thickened. 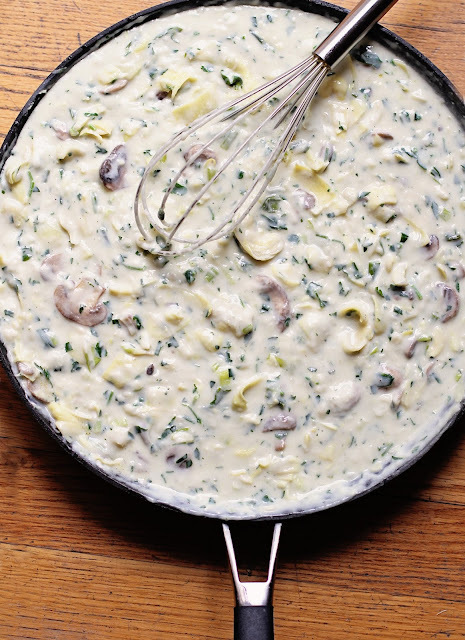 Add cheese, mushrooms, artichokes and lemon juice. 7. Pour sauce over chicken. 8. Bake at 350 degrees for 40 minutes. For tons more #QuickFixCasserole recipes, make sure to follow Country Crock on Pinterest. Anyone else a big fan of casseroles? ** I was selected for this opportunity as a member of Clever Girls Collective and the content and opinions expressed here are all my own. Oh my word! That looks delicious! This looks delicious...too bad my husband hates pretty much all casseroles! This looks so good! I am getting ready to try to clean out my pantry (mostly carbs, go figure)and start stocking the kitchen from scratch with (somewhat) healthy food. I am also trying to make food that will double for lunch the next day to save on my moolah budget and calorie budget. I think casseroles may be the way to go! Okay, this looks AMAZING! Definitely on my list to make! Wow that looks delicious. Also I think you missed your calling in food photography. Must try this! I love casseroles. I made loaded potato and chicken casserole this week and it was fantastic. yum! this looks so good. I agree, I'm all about easy meals too lately. This looks delicious! I'm a huge casserole lover myself. Like you, my dad did all the cooking in our family growing up. Casseroles are always nostalgic and heartwarming to me. If you're looking for a great new one to try, check out my post on Rice Broccoli Casserole here - http://shirazinmysippycup.blogspot.com/2013/08/rice-broccoli-casserole.html. It's super quick, easy, and delicious. It can be used as the main meal or as a side with other items. Either way, it's awesome. this looks amazing! i can't wait to try this :) great job and great photos! That sounds *so* good. I really hope that I can back to cooking this fall now that we have a bigger kitchen to work with! Does this freeze well? Made it last night,and it is fantastic. Makes a lot for one person though, lol.